The City of David is the area in the sunlight just left of center. Please click on City of David for a description of this important area. This 15 acre [6 ha.] 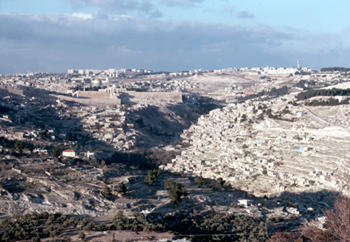 ancient core of Jerusalem is located between the Kidron and the Central Valleys (in the shade on the right [east] and left [west] of the core). It is situated here because of its nearness to the Gihon Spring. Notice how the Mount of Olives (to the right), and Mount Scopus (behind it), and the western hill (to the left) tower over it!